Located in the quaint, historic town of Williamsburg, Liberty Ridge features home plans with first-floor living on spacious, private wooded homesites where it is up to the homeowner to determine how much yard they want to maintain. Trails, Trails, and more Trails! Liberty Ridge features walking and biking trails in the community, Freedom Park is adjacent to the community, and access to the Virginia Capital Trail is nearby. Excellent medical facilities – Sentara Williamsburg Regional Medical Center was scored a five-star hospital by the Centers for Medicare and Medicaid Services. College Town – William & Mary allows citizens aged 60 and over to audit classes for free, Kiplinger pointed out. Great place for the grand kids to visit: Colonial Williamsburg, Busch Gardens, Jamestown, Water Country USA, and so much more! Williamsburg offers an array of shopping – everything from well-known major stores and outlets malls to boutique stores filled with the work of local artisans. And, New Town – where you can shop, dine, and explore – is just minutes away from Liberty Ridge. Proximity to Route 64 with easy access to travel to Virginia Beach, Charlottesville, Richmond and Washington D.C. Contact us for floorplans and pricing on first floor master suite homes built to suit your lifestyle! Click on the first floor master homes below to view floor plans. The Richmond by Wayne Harbin Builder, Inc. 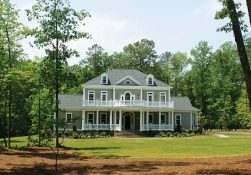 The Savannah by Wayne Harbin Builder, Inc.